The Bachelor of Science with Honours in Statistical Analysis and Data Science is a two-year top-up degree programme. This programme was formerly known as Bachelor of Science with Honours in Statistical Analysis up to intake year 2016. The programme curriculum has been updated to embed training for the professionals of data analytic to meet the expanding needs for data scientists. The programme offers 1-year Early Exit option to graduates with Bachelor of Science degree on completion of the required 40-credit courses. Holders of a Higher Diploma or Associate Degree in relevant disciplines to Data Science and Analytics, Engineering, Computing Science & IT, Statistics, Applied Science, Business Analysis and Finance, or those with equivalent qualifications at Higher Diploma or Associate Degree level may apply to this programme. The programme aims to provide university-level training to enable students to develop a thorough knowledge and understanding of Statistical Analysis techniques and data analytics skill for business management, operations research, and financial and risk engineering. Students in this programme are equipped with comprehensive training in using statistical software SAS and SPSS to enhance the structure of big data analytic and data management for decision making. Graduates of this programme will have the competence to take up jobs related to data analytic, marketing research, business and financial data management, statistical agencies, government sectors and education. Internship opportunities are available for students to develop technical and administrative skills in order to complement their education experience. 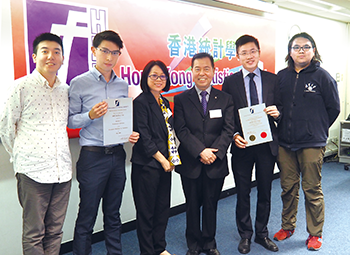 The OUHK student in this programme has been accredited by the Hong Kong Statistical Society (HKSS). The Modules 1, 3 and 4 have been exempted from its Professional Graduate Diploma if the student has successfully completed the assigned courses with Grade C or above (Detail of assigned courses can be referred to programme website). Statistical Analysis Graduates achieved the Graduate Diploma Certificate from Hong Kong Statistical Society.